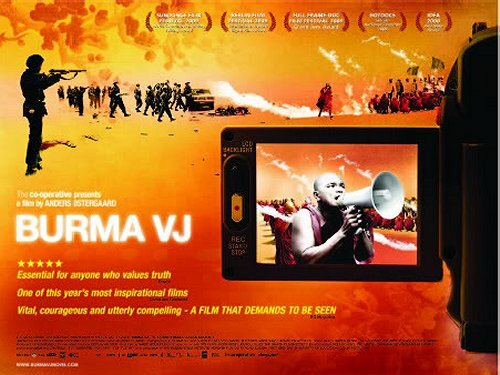 Just watched Anders Østergaard's independently produced film Burma VJ: Reporting from a Closed Country which documents how video journalists made images of the violent protests in Rangoon in 2007 available worldwide via Norwegian based Democratic Voice of Burma. The independently produced film is a very powerful case study of how quick and dirty media is working where mainstream media is failing. Talking of alternatives to mainstream media Burma VJ uses a track from Egberto Gismonti's eponymously titled 1978 solo album for ECM. On another ECM album, Sol Do Meio Dia, Egberto Gismonti played in a quartet which included percussionist Collin Walcott who was a member of the influential band Condona and Gismonti's music has been programmed by the Britten Sinfonia. Burmese opposition leader Daw Aung San Suu Kyi featured in my post Forget about heroes and Reporters Without Borders (Reporters sans Frontières) in Radio and re-education. David, your very civil correction is appreciated. It is now reflected in the published text.